Week 10 games were played November 6th-8th. This past weekend’s Players of the Week (week 11) will be announced on our show this upcoming week. At the bottom of this post, you can see the listings for when and where it will be announced. We will also put them on our site a week from today. 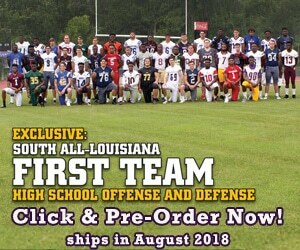 Our team at Louisiana Football Magazine will be selecting an Offensive and Defensive Player of the Week for each class (5A-1A) every week. Once selected, they are announced on our TV Show live on Tuesday and then on our website the following Sunday. (Note: this post is for Week 10 while this past weekend was week 11). For the first announcement for our players of the week, tune into our show which goes live on Tuesday in Baton Rouge, Lafayette, and New Orleans on Cox Channel 4. Listings for all other areas around the state can be seen at the bottom of this post. 5A-Defensive-D’Ronne Littleton DB, Carencro: 1 INT, Game winning punt return for a TD, 21-17 win over Lafayette which won them the district title. Next: 11th Show of the Season! Listings and Lineup Here!